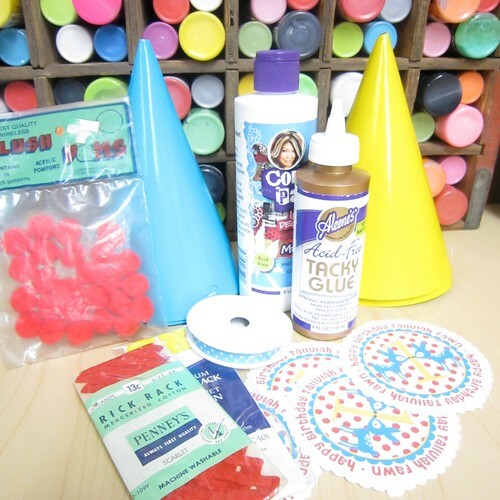 Sure it is a lot easier to hit the party store and buy a pre-prepared theme birthday party kit, but it is a lot more fun to make a party theme yourself. I admit I perused the internet looking for party hats and goodie bags that fit the bill for my daughter’s 1st birthday, but nothing seemed quite right. Then I contacted a few Etsy vendors that specialized in custom party gear that didn’t bother to write me back. Left with nowhere else to turn I decided to take matters into my own hands. Sure it was a whole lot of work, but the end result was exactly what I wanted. 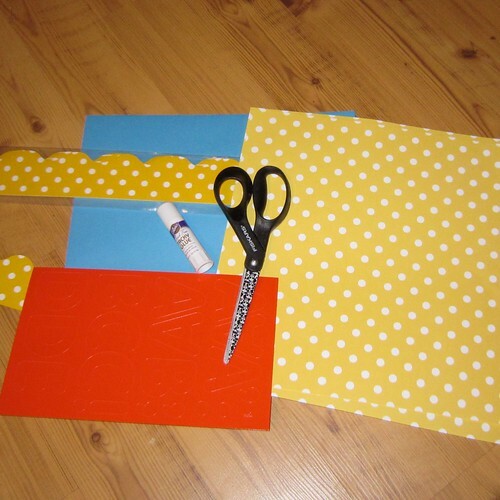 Today on I Love to Create we have part 1 of a 2 part series on how to create your own custom party decorations! 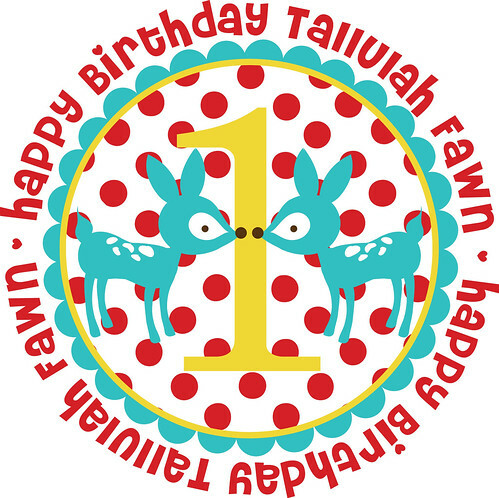 Every good party needs a theme and for this particular birthday I decided to work with Tallulah’s middle name, Fawn. I started to go with cherries and powdered wigs since she shares a birthday with George Washington, but that seemed a bit obscure for a 1 year old. Fawns are perky and fun and more importantly between my mother and I we had a ton of them to decorate with. First things first I had a logo designed by Autumn Leah Designs. Doesn’t everyone have birthday logos designed? From there all that was left to do was plaster the birthday logo on everything. Is there anything cuter than kids in party hats I ask you? You might remember from my escapades making fabric covered crowns and pipe cleaner tiaras that I am a firm believer in the idea that a decorated head makes everything more festive. Making your own customized party hats is easy as pie with a little Collage Pauge, colorful pom poms, Tacky Glue, decorative trim and blank party hats available at the party store. Those of you with an eye for detail might have noticed that I spelled Tallulah wrong with the blocks. I needed to steal an L what can I say. I also went to Home Depot and scored several feet of astroturf to cover all the tables with. I was going for a green grass feel with all my fawn and deer. 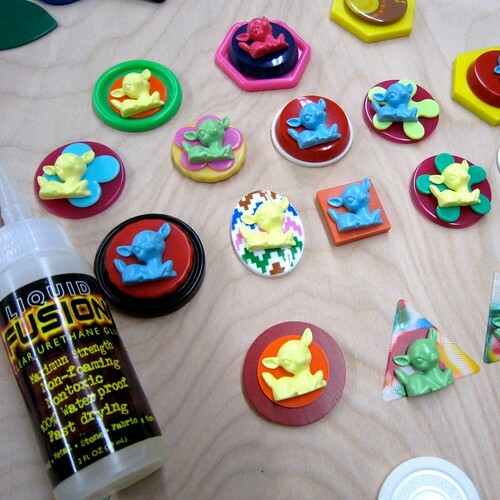 I ordered a whole slew of colorful resin fawns from Buzzard Brand. I made souvenir magnets for all the families that attended the party using various plastic cabochons, the fawns and Liquid Fusion Glue. 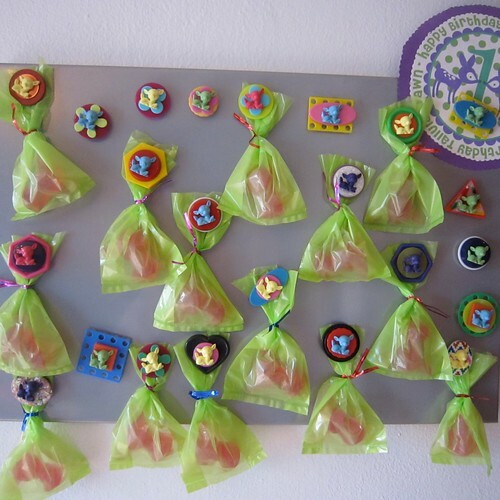 The little green baggies are filled with fawn shaped soap. Ordered the molds from Bake It Pretty and the soap supplies are Soapy Love. 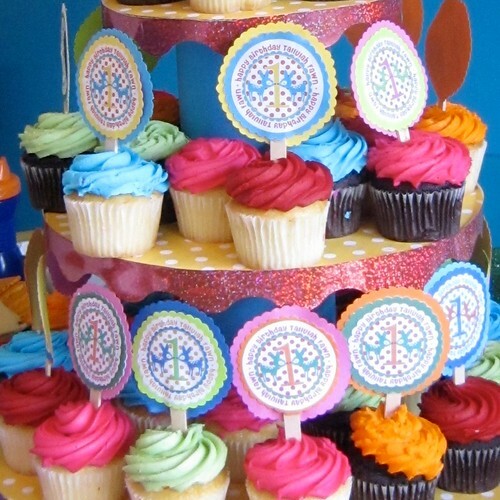 Cupcake toppers make the party, I’m a firm believer in that. You might recall the set I made for my baby shower. It seemed only fitting that a year later I would make them for Tallulah’s 1st birthday party. 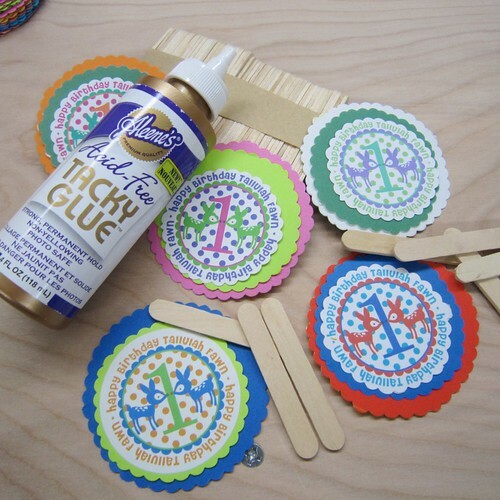 Using small wooden sticks, card stock, scalloped edge scissors and Acid Free Aleene’s Tacky Glue I had a batch of colorful toppers in no time. I tweaked my original logo in photoshop to get the different color combinations and printed them out onto card stock paper. I’m a bit notorious for taking a theme and running with it. I might have gone a little fawn crazy, you be the judge. 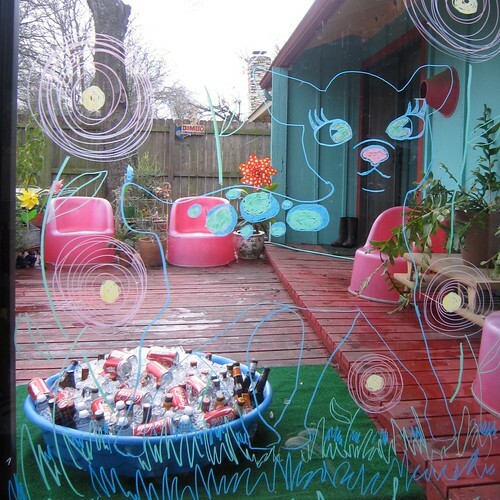 My amazingly talented sister Hope Perkins, who has a deer fetish of her own, did some creative window work for the party. 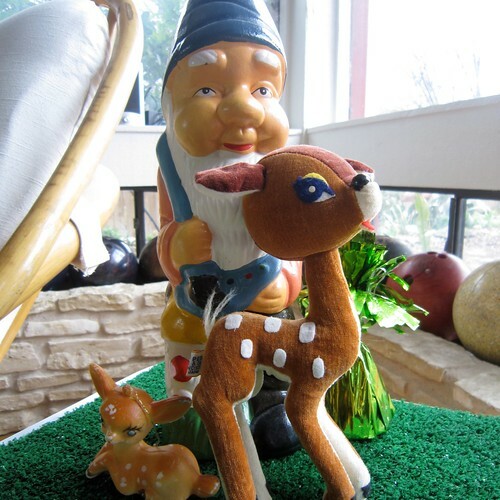 The sliding glass door had a polka dotted fawn on one side and a gnome for the wee ones to pose in on the other. After making a black cat banner at Halloween I caught a bit of banner fever. 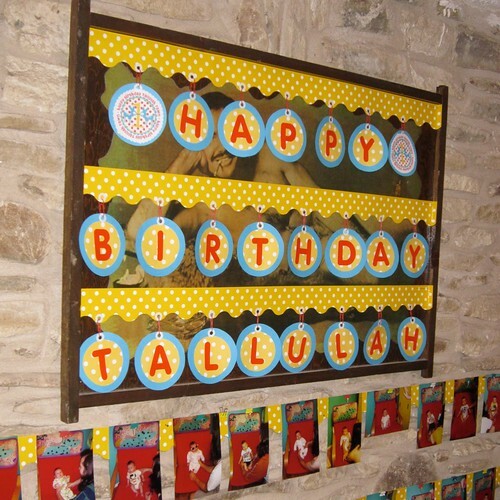 Using sticker letters, scalloped trim, cardstock, paper clips, hole punch, Aleene’s Tacky Glue Glue Stick and hole reinforcers I made a custom Happy Birthday Tallulah banner that censored the Burt Reynolds picture that lives in my living room. Remember this is a two part series. Tune in next Thursday for more birthday fawn, I mean fun. So what do you think did I go overboard? 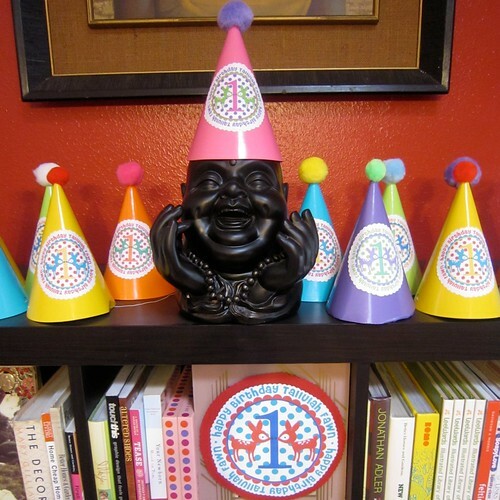 What kind of custom party decorations have you whipped up? I need to start planning for next year. 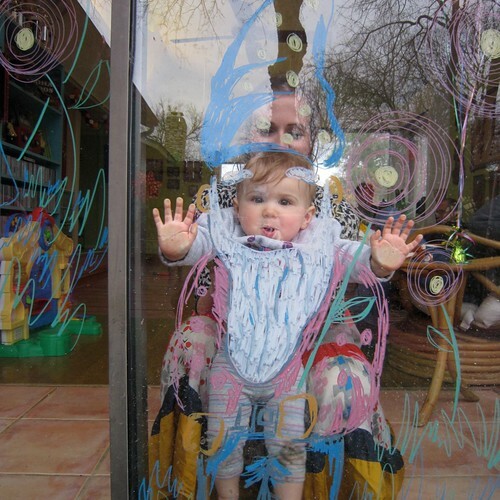 Posted February 24, 2010 & filed under I Love to Create, Kids, Parties. You did yourself proud with this one, Jen. You've given me something to aspire to for Clover's 1st b-day party! Vickie I need to start thinking ahead about amazing bday gifts for Quinn and Clover after those adorable fawn outfits you guys gave us. Leave it to you to keep your gift (and wrapping paper) in theme. That's why I heart you. Traci I miss you more, come to Texas already. One day I'll get the courage to leave Tallulah and come to you. Super fun party! You did a great job with the theme. I like to do dress-up parties for my kids' 1st bdays — and all the adults have to come in costume. Kris I know, that is why I have to start planning now. I've found that it's all about a theme for me. Heather a dress up party is a cute idea. We had a Halloween party for all the babies in our Mommy Meet Up group and kids in costumes are pretty dang adorable. We had little werewolves and sasquatches that would melt your heart. First off I can't even believe that those Etsy sellers never got back to you! Why bother having a shop?? Well, it looks like you didn't even need them! You did a great job and I especially love the cupcakes and toppers. Looking forward to seeing part 2! I love when creative parents come up with non generic themes for parties. This one was great and I have to say that I love, love ,love you pink outdoor chairs. They rock! And the little fawn buttons, I have to check that site out. That little girl is so lucky to have a creative mom like you. Wowzers. I feel like such a lame for taking Simone to Disneyland for her last birthday. That does it; for 6, I'm combing your site for ideas. You can NEVER go overboard when you have kids! What an awesome theme! Love this! Amazing! You did a fantastic job! Wish I would have been there in the fawn wonderland! Everything looks adorable! Kisses from Berlin! 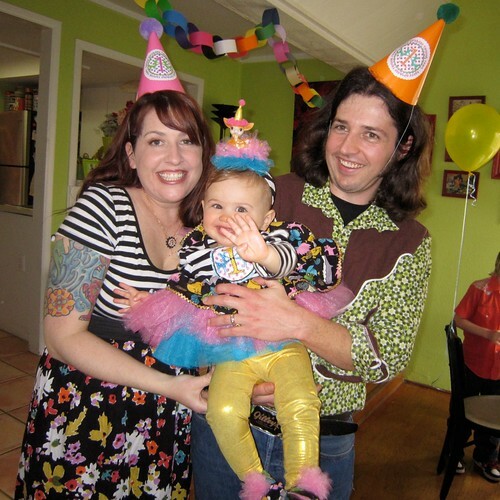 I want to have a birthday party for my daughter now…but hers isn't till December. maybe a half Birthday? I have an excess of Princess outfits from disney world, so we were thinking of having a tea party! So fun! Love the Logo! I want one! Stacey – well it all worked out for the best that they didn't write back because then I found the amazing Autum on Etsy who designed the logo and I got to make everything myself. Bee I wish you could have been here too. 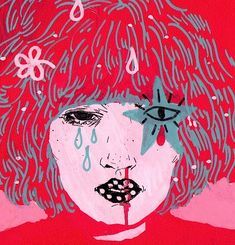 You will be back in Austin's loving arms in no time and then you can come to all the parties! I can't stop smiling!! Thank you SO MUCH for sharing all of these awesome ideas with us! Your daughter is one lucky little girl! What a lucky, lucky baby! 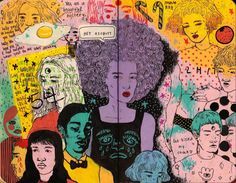 I love your sense of fun and color and whimsy! You're a breath of fresh air, Ms. Perkins. Wow! Amazing makings for a party!! This whole party is SO up my alley. I had kids mostly so I could throw them parties. But I think I want the gnome on the window idea for MY birthday! love the gnome photo-op. supercool! Jen, you never cease to amaze me! This is all too fabulous for words! 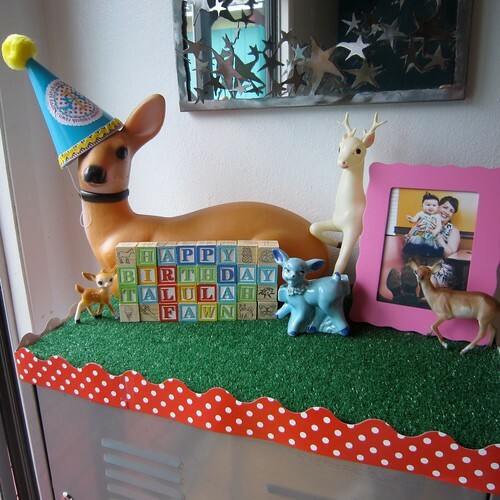 Your colors are so fun and the Fawn theme is just so kitchily awesome! Happy birthday Tallulah! Soooooo much fun!!! Happy Birthday Tallulah! I am so happy I just happened to stumble across you on Twitter! Amazing!! 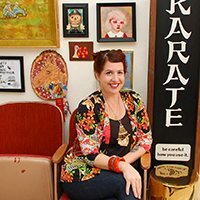 Let me know if I can feature your post on my birthday party site Party Planning Professor! You rock!!! Hey Elizabeth please feel free to mention the post on your blog! Thanks everyone for the bday wishes. I'll pass it on to Tallulah. Wow!!! The perfect party for an adorable girl! So much fun!!! I live just a hop away from you. 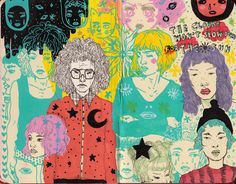 Love what you did. I always handmake as much as I can for parties. I cant wait to have kids and do the same for them. 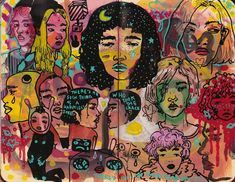 I love how you carried the theme all the way through, thats the toughest part you have to get creative to find everything. You gave me an idea with the magnets to do for another baby shower im hosting! Okay it's settled. You can throw parties for all of my relatives from now on. Serious fawnage = serious fun. Great stuff. This is fantastic! One of my middle names is Fawn too, and oh how I would have loved this as a girl! I can't wait to show you guys the rest of the pictures and "fawnage" (thanks for the new word JB, love it) on Thursday. Headbands, paper garlands, cupcake stands and more!